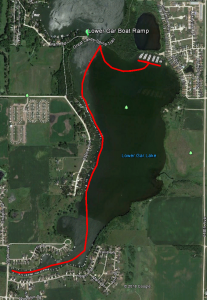 The East Okoboji Lakes Improvement Corporation, in partnership with the Iowa Department of Natural Resources and the City of Orleans, will be using a two-prong approach in 2018 to include mechanical harvesting and herbicide application. With the late ice-up and reduced snow early this winter curlyleaf pondweed had a great start since last fall. We anticipate it will be another tough year based on how much pondweed was growing under the early ice. The City of Orleans has again worked with the Iowa DNR to contract for mechanical harvesting. An inter-governmental contract was granted to the City from the state’s Marine Fuel Tax fund. The local match for those funds must be 25% . We estimate this should provide funding for up to 40 acres of harvest. 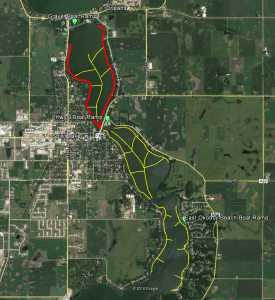 A contract is in place with Aquatic Environment Consultants for the application of Aquathol K. 20 acres (10 acres in the north bay of East Okoboji and 10 acres in Lower Gar Lake) will be treated. This represents a single pass with a boat. The herbicide is applied under the water surface using a closed system. Refer to the attached map below for reference on the application areas. Application of the herbicide is water temperature and plant growth dependent and with the way things are progressing we may be looking at late April or early May. Mary Skopec from Iowa Lakeside Labs is working on a plan to do water testing during and after the herbicide treatment. DNR has funds set aside to complete this task. DNR will be working with Dickinson County Emergency Management to plan an aerial survey of the project (both mechanical and herbicide treatment) to quantify our efforts. Areas in red on the maps below will receive a herbicide treatment. Areas in yellow will be mechanically harvested. The mechanical harvesting plan is subject to change depending on conditions and growth patterns. 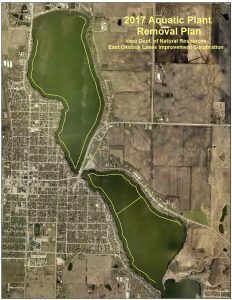 The East Okoboji Lakes Improvement Corporation, in partnership with the Iowa Department of Natural Resources and the City of Orleans, have contracted with Underwater Solutions to begin a trial harvesting of curlyleaf pondweed. Cutting and removal of the invasive plant will begin on or around May 15, 2017. Second cutting approximately 3 weeks later in June. Map at right shows the navigational lanes being harvested from the Narrows north to the State Fish Hatchery. EOLIC wants everyone to be aware of opportunities provided by Dickinson County Soil and Water Conservation District (DCSWCD) for individuals to receive grants of up to 50% match for installing a rain garden on your property if certain criteria are met. IN ADDITION, EOLIC, in our efforts to support our mission, will match 25% up to $500 on a limited number of Grants awarded by DCSWCD to OUR MEMBERS. We believe this is a great opportunity if you have a site that would qualify. For information, contact Derek Namanny at 712-336-3782 Ext. 3 or you can contact Bill Maas or Terry Wilts. This is an excellent reason to become a member of EOLIC! EOLIC and the Blue Water Garden Club continue to help the City of Spirit Lake maintain the demonstration ‘rain garden’ in Memorial Park. The plants are flourishing and the system is functioning very well, holding a huge amount of rain run-off and allowing it to slowly soak into the ground resulting in less debris and silt into East Lake. Last year EOLIC applied for and received a grant for a study in East Okoboji Beach of storm water run-off before, during, and after construction of paved roads in the area. Low Impact Development practices (rain gardens and bioswales) are being installed this summer instead of a traditional storm sewer system. This is the second year of a three year study that was requested by the DNR and is being watched state wide for proof that Low Impact Development Practices are effective and worth the cost. EOLIC is working to expand awareness of Aquatic Invasive Species (AIS) to prevent their spread into the Iowa Great Lakes. This year we paid for a new printing of the IGL BOATERS MAP, East Okoboji Lake version. This map includes AIS information and is available at boat ramps and various boating related businesses and facilities in the region. Board members also volunteered to help set up a local Tourist Information Radio station. Tune to 1640 on the AM band to hear AIS information and local weather. EOLIC has for several years been advocating new state rules that would protect Iowa’s waters from pollution and stem the trend of declining water quality in Iowa’s lakes and streams. This spring these rules were approved by the Iowa legislators. EOLIC participated by attending public hearings, writing letters of comment, encouraging legislators, and supporting the Iowa Environmental Council as they worked with the DNR to write acceptable rules.